Wim: Really knowing what time is, is of utmost importance. Lynette: Hey, yeah, I can agree with that! Wim: Just like it is important to know more deeply and extensively what space actually is. Lynette: Humm... now space is a wee bit trickier... or perhaps not... maybe I don't know, maybe time is trickier! Wim: We humans maintain some peculiar concepts about time and space, concepts that are often very abstract: geometrical or mathematical. Most of us have to learn to calculate to deal well with time, and space... Just telling time is not enough and negotiating space is even trickier with our tendency to attempt that in leaps, tumbles and bounds. Time, more so than space, becomes abstract very quickly, especially when one attempts to think about it. Too quickly people who care to think about time come consider it even non-existent. Of course time is quite intangible but if it perchance - through hurry and speed - becomes almost tangible, time quickly appears to be fleeting and seems to be able to escape our grasp. In human history, time was initially a conceptual discovery, but we humans quickly found that we could use time to our advantage if we could mix its abstract concept with tangible implements, thus tricking people and animals (unfriendly tribes and wildlife) with our speedy javelins, rocks and bows and arrows. Lynette: Yes, I get it and also... Humm... when humans discovered the temporal rhythms of the tides by observing the rising and receding of the sea, they also started to look at the skies, the moon, the sun. Who knows if even words like 'period' or 'menstruation' are time related? The word tides and time surely are - you showed me on Internet the other day that both come from ancient roots that denote time. Wim: 'Menstruation' of course comes from 'month' and month is related to the periodic cycles of the moon. Not only that, also the seasonal rhythms of flooding rivers became noted and early agrarian and husbanding farmers took advantage of their understanding of that cyclicity. At some point humans even invented ways to play with time, we could almost manipulate it, at least we thought so... fertility rituals and timing were intricately interwoven. Lynnette: So true and instead of letting time be and run its course, we found ways to seemingly speed it up or slow it down...: we invented haste and tardiness, we learned to extend durations but we also invented shortcuts. of prehistoric use and assumptions. Incidentally, I have some very early poems of mine in Dutch in which I'm trying to come to grips with that. Lynette: Cool... could you translate one for me? That is the quick gist. Wim: Yes indeed! In fact I see space-time as resulting from the reciprocal process of Energy turning into Matter and vice versa: a space-time dynamic that happens so to speak inside the equal sign of Einstein's formula E=Mc2. 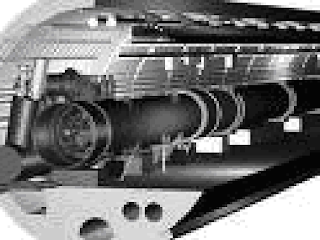 secondly we deal with time as though it is running in one direction only. Lynette: The 'square root of time'? How on earth did you come up with that idea... 'square root of time'? So far that means nothing to me. Wim: Let's look at Einstein's formula E=Mc2 again and notice that it says 'c2', which means 'speed of light squared'. I don't think it is hard to see that the speed of light includes the notion of time: a certain distance traveled at a certain speed definitely includes the notion of time. Time must be two dimensional or square. From that c2 I intuited a few years ago that time in a grander sense than usually considered, must be two dimensional or square... otherwise that formula wouldn't work. 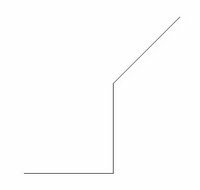 Square or rectangular... something with two directions, one direction linearly and the other one also linearly but... orthogonal to it... at a 90 degree angle so to say - although I must admit that that is clumsy way of saying it. Lynette: I can imagine it well though, I'm thinking of a flatlander. Flatlanders (however imagined they must be) are not aware of the third dimension... the one up and down, although we-non-flatlanders know that it does exist. Similarly I can imagine that time might also have an extra dimension, that it has an extended structure, something that is... Humm... planar (?) is that a good term? Wim: Yes, right enough to spark our intuition. 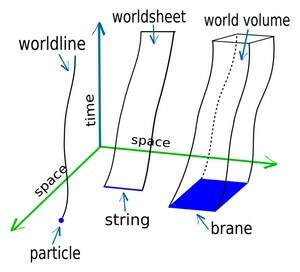 Although we shouldn't mix up scientific topics, but String Theory (particularly M theory) uses terms like 'world-line' and 'world-sheet', and their depictions (a visualization trick that represents some wonderful mathematical tightrope dancing) do come in handy to help visualize the two-dimensionality of time. But let's not go there yet, as what I'm suggesting is only meant to be analogous. Lynette: But it is still OK then to visualize the two dimensionality of time as a surface-like something? Square or rectangular? Wim: Yes, like on a horizontal plane... but hmm...time-wise. I feel that evolution has something to do with that second temporal dimension, some kind of 'value adding' evolvement. If time were only one-dimensional, there would simply be more of the same, a simple quantitative repetitiveness, an increase in numbers (quantity) but not in complexity (quality). It's in the complex forms of matter and life that the second temporal dimension appears to come in a special manner. Too bad that at this point we can only be led by intuition and imagination, I hope it works reliably enough though. Lynnette: Could it be that crystals tend to follow the one-dimensional route and that more complex structures - living things maybe - include the second time dimension? Wim: I think you are right, but it seems to me that crystalline structures use the first dimension of time in a bi-directional way. An English mathematician and physicist Roger Penrose has observed something like that in what unfortunately are called 'quasi crystals'. These are crystals that are built up according to a rare symmetry: a five-fold one. They start out in a certain pattern that can only work towards a crystalline form if the final outcome is known beforehand, it also involves a-periodic patterns. It seems to me that some two-directional information exchange must be taking place time-wise between result and origin, while the atoms are on their way to form the crystals... (it is called teleo-dynamics)... if not, the first steps could not be taken as they are. 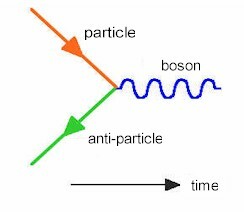 Note how the anti-particle moves backwards in time. Lynnette: Wim, can we get back to the square of time? Let's say that for some strange reason 'grand time' (let me call it that way) could be represented by a number, say 'nine'. Lynette: OK, let me just follow you, but I won't pretend I understand if I don't! Lynette: Three!!! Actually it is positive and negative 3! Wim: Right, three... well that's a whole lot less than nine... Oh, and the algebraic fact that you mention, that it is a negative number as well as a positive one could be used to show how time can go hither and thither!!! By the way that number 'nine' is not supposed to be significant here, but then... humm... come to think of it, maybe it is, we shall see. For now though with that example I just wanted to give you a sense of how we (by taking the square root) analytically formed a concept about grand time in which the analysis by itself made us lose sight of quite some other dimensional aspect. Lynette: Well, I can't say I get that, but I have to admit that I feel pretty good that I now can see - darn it, I may have proved it to myself! - that time flows backwards as well. Wim: Yes, let's make sure that we understand that M stands for mass and that the c2 part in this formula somehow... (remember c stands for the speed of light) ...points to the two dimensionality of time. Einstein's formula could very well represent a process, rather than just an equation, although it is not necessarily meant to be understood that way. Energy 'E' equals some three dimensional quantity or mass 'M' multiplied by something involving the square of something… 'light' with a specific speed… 'c'... the speed of light, right? I am still pondering that 'three dimensional quantity or mass'? I'm OK enough with 'time squared' for now, but what about M or mass? I always had great difficulty understanding mass, I always get it mixed up with weight, force or size. Now size, that is clear to me, that has to do with space and that is three dimensional, but, hey..., did you not let me read this book: 'Superstrings: A Theory of Everything' by Davies and Brown? It explained that according to String Theory space-time could contain four, five even ten dimensions. Wim: They are up to eleven dimensions now. But that reminds me; I promised that I would explain those extra dimensions... one extra for time (which I did) and an additional six for space. 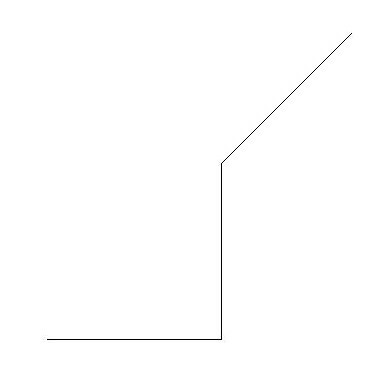 Wim: Can you for now just imagine those three directions as simple lines? 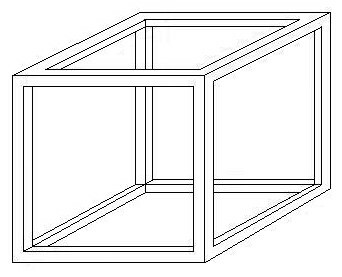 Actually, just for now see those directions as represented by the ribs of the cube, its edges...! Lynette: Shall I draw it? Does it look something like this, is that what you mean? Wim: Yes, right... In fact that is excellent! Wim: Yes, but from a far distance that rod would look like a line... right? It seems to have only one dimension... length! Wim: Closer by though you see that it is a tube with height and width, two more dimensions, right? except that the seemingly tiny cube is the same cube but much further away. 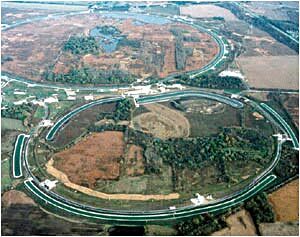 sub-nuclear sized phenomena through one of the largest microscopes in the world, the Tevatron, which is really a particle accelerator and collider, then suddenly those extra dimensions show up. Wim: True, that's why String Theorist call those dimensions 'rolled up' or 'hidden' and as I said they have now theorized up to six extra ones. Lynnette: Yes, I see that: six extra altogether, which is two extra ones for each of the three ordinary spatial dimensions... for a total of a grand nine! Wim: Grand indeed! So let us call it 'grand space': three as we see them in our ordinary world and another six that play quite a role when operating on sub-nuclear scales: the world of quarks, bosons and fermions... actually the world of particles, strings and branes. Lynette: So nine spatial dimension plus those two temporal ones that you mentioned before...! That comes to a total of 11 dimensions for 'grand space time'. Lynette: Eh, Wim, sorry to interrupt, but what about the notion that sometimes when you are 'in the zone' that you don't experience time, or that sometimes time seems to go faster or slower or doesn't move at all? Can you account for that...?